(HOUSTON - July 11, 2017) Today, the Texas Justice of the Peace and Constable Associates (JPCA), the largest association of elected officials in the State of Texas, appointed Judge Holly Williamson of Harris County Chair of the Education Committee. Williamson will lead the association in the judicial education of more than 800 Justices of the Peace across Texas. "I am honored to be selected the Chair of TJCTC Education Committee. Judicial education is a key component in administering justice in the peopleâ€™s court." Said Judge Williamson. "I look forward to serving as the Chair, and am proud to be involved with the education of the judges who are on the front lines of the Texas justice court system." Since 1958, the TJCTC has been providing judicial education for its members through schools, seminars, workshops and webinars in order to help them better serve the people of the State of Texas. Judge Williamson was sworn into office as the Justice of the Peace for Harris County, Precinct 8 on January 1, 2009. She served as Co-Presiding and Presiding Judge for the 16 Justice Courts in Harris County from 2009-2015. She has been a professional member of the TJCTC Education Committee and has also served as a faculty member of TJCTC since 2009. (HOUSTON - October 16, 2012) The Houston Bar Association (HBA) today released the results of its 2012 Judicial Preference Poll. The results are posted on the HBA Web site, www.hba.org. In each election year, the HBA asks its members to indicate their preference in contested judicial and some administrative races. The 2012 Judicial Preference Poll includes Democratic, Green, Libertarian and Republican candidates in contested races for the Supreme Court of Texas, the Court of Criminal Appeals, the Houston Courts of Appeals, Harris County District Courts, Harris County Courts at Law, a Justice of the Peace Court, Harris County Attorney and Harris County District Attorney. There were 11,646 polls mailed out to HBA members, with 1,762 members returning polls, or a return rate of 15 percent. Believing that an informed electorate is vital to the efficient administration of justice, the Houston Bar Association has conducted judicial polls since the early 1970s. *The Judicial Preference Poll is not an endorsement by the Houston Bar Association and any use of the information contained in this poll, including publication of advertising, must reflect that the poll is not an endorsement by the Houston Bar Association. The Houston Bar Association is a nonprofit, professional organization for attorneys. The HBA, the fifth largest metropolitan bar association in the nation, provides professional development, education and service programs for the legal profession and the community. Judge Williamson's experience and judicial temperament make her the voters' clear choice. In Texas, as in most of the country, candidates for justice of the peace do not have to be lawyers. This makes more sense in some places than others. Sparsely populated rural counties may have difficulty finding attorneys qualified to hold the position. Cases decided in the courts can be appealed to higher courts in a way that grants unsatisfied parties the opportunity for a do-over. And the lower stakes of justice of the peace courts - Class C misdemeanor criminal cases and minor civil matters, such as traffic tickets - don't always require full expertise with the law. But often they do. And in those circumstances, justices of the peace lacking a legal education will sometimes give a call to lawyers like Judge Holly Williamson, the current Justice of the Peace for Precinct 8, Place 1, and our choice in that race. A graduate of the University of Houston Law Center and a certified mediator, Judge Williamson was elected to her position in the 2008 election and is well qualified to serve a second term. Administering a court that handles more than 20,000 cases a year, Williamson oversees both civil and criminal matters, such as traffic cases, hot checks and evictions. Williamson, a Republican, also runs the truancy docket, an often overlooked but deeply important separate docket that exclusively addresses cases of students skipping school. Truancy can be a hazardous step along the school to prison pipeline, so we're especially supportive of Williamson's involvement with the Harris County Stay in School program, which successfully uses warning letters and diversion agreements to reduce truancy and keep kids out of juvenile district court. 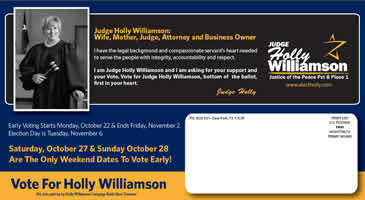 In this race, Judge Williamson faces Democratic challenger Tommy Ginn. We like Ginn's passion for fairness and equal treatment, but we favor the legal background that Williamson brings to the post. Williamson's experience and judicial temperament make her the voters' clear choice.